If you want to begin breeding zebra finches, it is better if you call a vet so that he can help you to assess if they are in the right health for breeding. They should be free from any physical defect and over one year of age. The breeding zebra finches have to have enough room for flying around and to exercise. If you can get a bigger cage, then the better it will be for the zebra finches. You can add in the cage a woven nest or traditional a small box. If the finches cannot go to look for the nesting materials at their own, then remember to add the nesting materials in the cage such as shredded papers. Breeding zebra finches will also need a staple food like a pellet mix and finch seed. You can also supplement it with the vegetable and slices of fruits. Fresh sprouts are also nutritious and are good for the breeding pair. To prevent egg binding, you have to add the calcium supplement to the food you give your breeding zebra finches. Normally you can expect to get at least 8 eggs at maximum for one clutch while the minimum can be 3. The female lays an egg every day until she finishes and she will begin incubating immediately after the last egg has been laid. 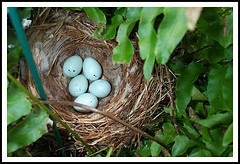 Normally you should begin to look for the babies in 12 to 15 days after the day the last egg has been hatched. If the egg is not hatched within 20 days, then you should begin to consider it infertile. You should let the breeding zebra finches to handle their babies at their own without any disturbance. Before you begin breeding zebra finches, you have to keep the following in mind. You have to select only suitable couple who are in the best condition to breed and to place them in the same cage. When visiting breeding finches, let them be aware that you are coming so that you do not frighten them. Do not force them to leave the nest if they do not want to. Get ready with the nestling food so that you can begin to feed it to the breeding zebra finches as soon as the eggs start being hatched. You can buy the nestling food from the pet shop or you can make one yourself. In case you want to identify the birds later, you can fit them with a coded ring when they are at least 10 days. After two weeks, you have to get rid of the nest so that the breeding zebra finches will not begin another clutch. After a month and a half, you have to get the babies out especially if you need another clutch from the parents. Sometime the parents also can begin to chase the babies out of the clutch by plucking the feathers. When the feathers begin to change colors, you will be able to differentiate the females and the males and to keep them apart if you want to. You should avoid inbreeding at all cost if you want to keep healthy zebra finches for long. This entry was posted in Breeding Finches and tagged how to breed zebra finches, Information on how to breed zebra finches, zebra finches. Bookmark the permalink.